Data complied by on-line lodging search engine AllTheRooms.com shows that rates for upscale lodging in 2014 increased by more than 15% from the previous year. Rates vary by season, with winter stays in general much lower than other times of the year, the company noted in a statement announcing its 2014 5-Star Pricing Index. January through March was the least expensive time of the year. Even though luxury properties in peak-winter destinations like Aspen and Miami skewed the results, the index rates on average were well over $100 per night less than during the summer months. "If you look at cities like Boston or Seattle where the weather plays a higher factor, the average rate of stay almost doubles during the summer seasons," Joe DiTomaso, CEO and co-founder of AllTheRooms, said. "When people plan on indulging in a luxury hotel, the pricing index proves it's wisest to book during the early season." 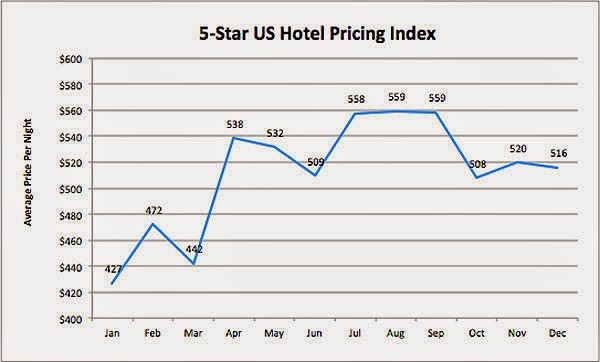 Lowest prices for 5-star hotels were available at the beginning of the calendar year, when average rates were around $427. Prices experienced a temporary uptick for the February holidays, including Valentine’s Day, before dropping again for the remainder of February and March. However, once April began, rates resumed their climb and averaged over $500 for the rest of the year. Overall, summer was the peak time for these hotels and rates stayed consistent high, around $550 per night, from mid-June through September. From October through December rates stayed firm at above $500. Surprisingly the busy holiday season didn't affect rates, as upmarket properties generally stayed consistent through Christmas, even while lower-tier hotels found a spike. "More family travel [could explain] such a disparity," DiTomaso said, noting that families with children would likely stay at a more family-focused type of lodging. “If stays are more than a couple days price eventually becomes a factor in making a reservation. Perhaps these properties are trying to keep consistent rates to entice those debating on whether to spend $250 on a stay at a 4-star hotel or spend the extra $50 and stay at a Ritz-Carlton." While those consistently higher room prices may not be the best news for travelers, it is certainly good news for those who own and operate hotels, as it marks an increase that surpassed the overall U.S. economy during the last four quarters, the company noted.